Mega-director James Cameron has never shied away from telling us what he really thinks about any given subject, which is why the overwhelmingly positive comments he's made in a new featurette about Terminator Genisys fill us with hope for the upcoming film, even if its trailers haven't managed to do so. Cameron, who was not involved with the movie at all, refers to Genisys as "the third film" in the series, effectively disregarding Terminator 3: Rise of the Machines and Terminator: Salvation, and placing the new film alongside his own much-loved entries. The director describes Genisys as being as "very respectful of the first two films," also stating that he feels "like the franchise has been reinvigorated, like a renaissance." With that in mind, it's important to remember that James Cameron once gave similar praise to the film Aliens vs. Predator, ranking it third among the films in the Alien franchise. Watch and listen to Cameron praise Terminator Genisys in the video below. 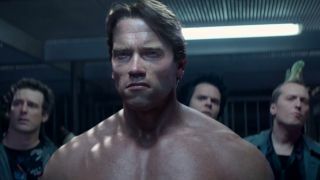 You can also get a helping of previously unseen footage, including several shots of a young and computer-generated Arnold Schwarzenegger, and a new interpretation of a scene from the original movie which sees Bill Paxton's character seemingly re-imagined as an enthusiastic Canadian.